Drivers Unlimited provides luxurious transportation to all areas in Fairfield County. With our fleet of town cars, SUV’s and Corporate vans, we provide transportation for a wide range of events. Our Fairfield County car service is the perfect chauffeured car service for all your corporate activities. Additionally, trust our Fairfield County car service for transportation to all your personal events in and around the New York Metro Area. We have chauffeured solutions for transportation to a NYC airport as well as if you are looking for an SUV for a night on the town. Our knowledge, experienced drivers and customer satisfaction are all reflected in our excellent reputation. Let us provide chauffeured transportation for all your airport transportation needs. We are the local experts with intimate knowledge of Fairfield County and surrounding areas. Regardless of traffic conditions, we will get you to the airport on time. When you need chauffeured transportation to LaGuardia or a JFK airport car service, you can trust our team to always provide the most efficient ride. In summary, our Car Service can transport any group size with our Town Cars, SUVs and Corporate Shuttle Vans. Drivers Unlimited is known for reliable service. Experience the luxury of traveling in our top-quality vehicles. Our Fairfield car service provides the most relaxing way to travel. Driver Unlimited’s reliable chauffeurs and dedicated staff give 100% to get you to your final destination in the most safe and comfortable manner. Our premium service is available 7 days a week, 24 hours a day with best-in-class customer care. From the moment you contact our team, we will look after all your needs and take care of the fine scheduling details. This guarantees that you enjoy a safe and efficient trip. We look forward to serving you in the near future. Fairfield County is an affluent county in the southwestern corner of the U.S. state of Connecticut. 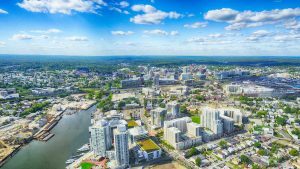 The most populous county in the state, the county population represents a little over 25% of Connecticut’s overall population and is one of its fastest-growing counties. The closest CT county to New York City, the county contains four of the state’s largest cities – Bridgeport (1st), Stamford (3rd), Norwalk (6th), and Danbury (7th) – whose combined population is nearly half the county’s total population. With Interstate 95 and the Merritt Parkway increasingly clogged with traffic, state officials are looking toward mass transit to ease the county’s major thoroughfares’ traffic burden. New office buildings are being concentrated near railroad stations in Stamford, Bridgeport and other municipalities in the county to allow for more rail commuting. Unfortunately there is no direct railroad lines from Fairfield County to any of the NYC airports. Within Fairfield County there are two regional airports: Igor I. Sikorsky Memorial Airport in Stratford and the Danbury Municipal Airport in Danbury. The county is also served by larger airports such as Bradley International Airport, John F. Kennedy International Airport, LaGuardia Airport, Newark Liberty International Airport, Tweed New Haven Regional Airport, and Westchester County Airport.